Jeremy Corbyn came under attack yesterday for his refusal to countenance the use of nuclear weapons, writes Commander Robert Green. 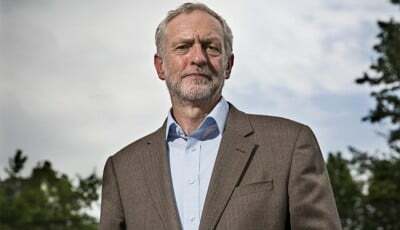 But his stance is honourable and both legally and strategically correct – especially with his opposition to renewing the Trident nuclear missile system. The current UK political leadership’s threat to use UK Trident requires the four submarine crews to be prepared to commit nuclear terrorism, risking them being branded as guilty of the Nazi defence against war crimes. As a former operator of British nuclear weapons, I support your rejection of Trident replacement. I write as a retired Royal Navy Commander. I have served my country in the crew of a Buccaneer nuclear strike aircraft with a target in Russia, and subsequently on Sea King anti-submarine helicopters equipped with nuclear depth-bombs. Here are my reasons, in response to some of the erroneous pro-nuclear advocates’ arguments. The Government, Ministry of Defence, RN and public face a reality check regarding the defence budget. Respected commentators are expressing growing concern about the mismatch between ambition and austerity; and Trident replacement is set to be the single-largest procurement programme of the next decade. When weighed against the gravity of the implications, how rational and responsible is this? Besides, was not this decision rendered hollow once the ‘independent British deterrent’ came to depend upon a US-leased missile system, US software in the fire control system, US targeting data and satellite communications? This trumps any purile ‘Little Englander’ political posturing about the French. US officials have warned that if Britain asks the US to provide a replacement system for Trident, it will become “a nuclear power and nothing else.” So would it not be wiser to turn the current defence budget crisis to advantage, and exploit the opportunity cost to provide a far more tangible, useful and credible key defence diplomacy and conventional deterrence role? The US and UK would not to have to sustain the fiction of UK nuclear independence; and the UK government would be seen to have truly enhanced its special relationship as closest US ally, rather than nuclear vassal. As for this macho ritual ‘nuclear test’ of British political leadership, the reality is that no Prime Minister would have to ‘press the button’. That dirty work is delegated to the Commanding Officer of the deployed Trident submarine. And back when I was in a nuclear crew of a Buccaneer strike jet or Sea King anti-submarine helicopter, we were given that dreadful, suicidal responsibility. The current UK political leadership’s threat to use UK Trident therefore requires the four submarine crews to be prepared to commit nuclear terrorism, risking them being branded as guilty of the Nazi defence against war crimes. Furthermore, nuclear deterrence is a disingenuous doctrine, because it is militarily irrational and not credible, for reasons set out in my book Security Without Nuclear Deterrence. The Soviet motive in occupying Eastern Europe was to create a defensive buffer zone and ensure that Germany could never threaten them again. Soviet archives show that NATO’s conventional capability and soft power were seen as far more significant than its nuclear posture. Russian misidentification of a Norwegian meteorological research rocket 1995. Also, it prolonged and intensified the Cold War. As for stability, the reality is that nuclear deterrence stimulates arms racing – and some 1,500 US and Russian strategic nuclear weapons remain at dangerously high alert states, especially with the reckless nuclear posturing over Ukraine. The Court, under heavy pressure from the three NATO nuclear weapon states, did not specifically pronounce on the legal status of nuclear deterrence. However, it determined unanimously that any threat or use of nuclear weapons must conform to international humanitarian law, and confirmed that the principles of the law of armed conflict apply to nuclear weapons. The envisaged use of even a single 100 kiloton UK Trident warhead could never meet these requirements. This is a direct consequence of the P5’s use of nuclear weapons as a currency of power; and their modernisation plans flout their obligation under Article 6 of the Nuclear Non-Proliferation Treaty (NPT) to get rid of their arsenals. For the 184 states which have made a treaty commitment to renounce nuclear weapons, the UK’s moral authority is compromised by its nuclear posture. Neither qualified as a recognised nuclear weapon state. The UK was the third state to detonate a nuclear weapon, and is one of the five permanent members of the UN Security Council (known as the P5). British anti-nuclear breakout, therefore, would be a sensational game-changer. Seizing this moment to take the initiative would enable the Government genuinely to claim this was in line with its commitment under NPT Article 6, and to be a ‘force for good in the world’, from which it would reap massive kudos and global respect – for example, Britain would retain its P5 status. The opportunity cost for the RN would be immediately measurable; and the Army and RAF would no longer resent the RN’s preoccupation with a militarily useless irrelevance. Commander Robert Green, Royal Navy (Retired). Robert Green served in the Royal Navy from 1962-82. As a bombardier-navigator, he flew in Buccaneer nuclear strike aircraft with a target in Russia, and then anti-submarine helicopters equipped with nuclear depth-bombs. On promotion to Commander in 1978, he worked in the Ministry of Defence before his final appointment as Staff Officer (Intelligence) to the Commander-in-Chief Fleet during the 1982 Falklands War. He is now Co-Director of the Disarmament & Security Centre in Christchurch, New Zealand.